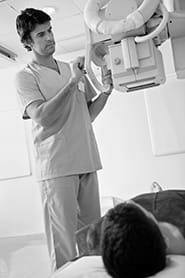 Scanning equipment operators take x-rays and computerized axial tomography (cat or ct) scans or administer nonradioactive materials into patient's blood stream for diagnostic purposes. Includes technologists who specialize in other modalities, such as computed tomography, ultrasound, and magnetic resonance. Explain the scanning procedure to patient. Position and immobilize the patient. Monitor patient's condition and reactions during the procedure. Use radiation safety measures and protection devices to ensure safety. Obtain and interpret medical images. Correlate findings from medical images with other tests. Recommend further examinations or treatments. Maintain records for doctors for further diagnosis. Keep equipment and instruments in good condition and make all necessary preparations before scanning the patient e.g. by preparing the contrast fluids. Handle and dispose of hazardous, infected or chemical substances and materials.